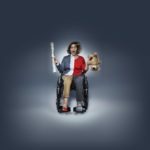 Maintaining your Manual Wheelchair for Optimal Performance! A smooth ride encourages efficient propulsion and decreases upper extremity repetitive strain injury. Without wheelchair maintenance, an individual can feel as if they have lost function and/or need to move into a new piece of equipment when in fact some simple repairs improve the performance. In this blog are well established general maintenance “best practice” for manual wheelchairs. As the wheelchair user, you may notice day to day that the wheelchair is harder to push, or veers off course even when on a flat level surface. There may be a change in your medical status or well being, but it could also very well be a maintenance issue that can significantly impact the efficiency of the device. Some users will describe this situation as feeling as if they are “pushing through mud” or pushing “up an incline” all day. It is generally recommended to inspect your mobility device every month. This will help you establish when you or your caregiver or support network should “service” the chair or whether it is best to call a professional supplier or maintenance technician. 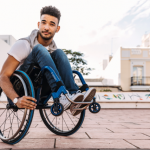 At your wheelchair delivery and fitting, the equipment supplier and therapist should discuss the importance of maintenance to wheelchair performance and the effect it can have on your functional mobility. If this was not discussed, ask the supplier to review the maintenance with you. The items to Inspect and check for on a regular basis include: rear tires, front casters, caster bearings, for wear and tear, puncture, cracks, bulges, looseness, flat or worn out spots. All of these components are in direct contact with a variety of surfaces and of course usage differs per user, and therefore monitoring for repair or replacement is important. For air-filled tires, if you press your thumb into the tire more than 5 mm, it usually indicates the tire requires additional air. Follow the recommended tire pressure written on the tire. Use a manual hand pump or air compressor to fill. Be sure it has a gauge to avoid over or under-inflation. When out of the wheelchair, lift one side of the chair at a time and rotate the wheel to check the bearings. Also, rotate and swivel the rear tires and casters to ensure they rotate smoothly and consistently. Check the spokes of the tire by squeezing two spokes together gently and repeat all the way around, if the spoke “gives” or “bends” when you gently squeeze you may need call a service technician, unless you can tighten yourself or find a bike shop who can assist. Be sure the wheels are aligned and that there is no squeak or side motion while propelling on a smooth surface. The axle should slide smoothly through wheel and you should hear and feel it lock firmly into place. Wheel locks should hold the tire firmly. They should be easily activated and should not interfere with the wheel when rolling. Adjust if they loosen and when tires are newly inflated. Inspect cushion covers and the cushion for holes or tears. Exposure to wrinkled fabric can cause additional pressure to the skin and cause a skin abrasion or pressure ulcer. Be sure the attaching hardware is secure, especially for the backrest as this could be a safety issue. With age, upholstery can loose its shape and “sling”. This can cause changes in posture, pressure, sitting balance, even ability to propel efficiently. If there are adjustable tension upholstery with velcro straps, tighten the straps where you need the support (as per your therapist), and check if it is worn and needs to be replaced. Components attached to the main wheelchair frame, such as leg rest hangars, footplates, armrests, will loosen with use over time. Be sure to inspect to ensure attaching hardware has not fallen off, or become loose. Identify and have on hand either metric or imperial Allen keys or tools to tighten these components. With wear and tear, metal edges may become sharp or stick out. Carefully run your hands around the edges of the chair to be sure there are no sharp areas. Check to be sure welds and bends are intact. Wipe down the frame with soap/water and be sure to dry thoroughly if the frame gets wet to avoid rust. The wheelchair should ideally be stored inside to avoid absorbing moisture. Remove dirt, hair and lint from the wheels, caster axles and casters. Clean the quick release axle with lubricant to be sure they smoothly pull out and reposition correctly onto the frame. Generally, maintenance is recommended four times a year such as applying a spray lubricant at the hinges to keep them moving smoothly. Generally it is best to have a professional maintenance service at least once a year. If you live in a harsh weather area, more frequent servicing is recommended. So I Got my Manual Wheelchair- How do I Develop my Wheelchair Skills? 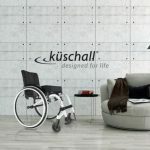 Folding vs Rigid Manual Wheelchair Frames- How do I Decide?